As night time fell, dusk took its toll. Darkness filled the world once more. She managed to find a small cave, a dead end was found about eight feet in, allowing her to manage comfortable room for maintaining ease of campfire setup. With only one way in, she could also be able to see what was happening before it happened if anyone were scouting for her presence or a passing enemy happened to stumble past. A short while after Saori had taken to the cave a shrieking cry can be heard from the sky outside of the cave. Suddenly a thud can be heard outside as well as a rattling sound. Again the cry can be heard as the sound of something coming closer can be heard. A figure comes into view in the entrance of the cave. While it could be easily mistaken for a skeleton upon closer inspection one could see that the creature indeed had skin though it didn't appear as though there was anything between that and its bones. It puts its club in a special 'holster' and then draws its bow. As it draws the string back it would appear as though it had forgotten the arrow. Shortly after though where its hand pulling back on the string it starts to glow an orange light that illuminates the cave. As she remained potentially stagnant in the cave, kinetic energy turned into potential energy in sudden eruption of inevitability. She had been detected by what seemed to be a skeletal structure whom yet had skin attached. As it pulled its bow, Saori would have dove to the side, quickly grabbing the sack of iron ingots she had previously picked up, winging them toward the entrance and into the direct path of the illuminating orange dart. Its a magic bow... The very thought crossed Saori's mind. If she could manage to kill this thing without damaging the fragile quality of the bow, she may very well be able to use it. This would have effectively blocked the oncoming attack and negated any practical area of effect it may have carried along with it, using the force from the thrown bag of ingots to knock it back toward the enemy before her. Being as though she was in the center of the eight foot cave entrance, she would have only been four feet in, and the enemy would have been an additional six feet out. In accordance, the ingots would have probably hit the enemy if they didn't hit the dart. Following suit with the path of the ingots she had thrown at the skeleton, she used the gap in time and the sudden momentary explosion which would most likely 'shock' the enemy due to the shockwave of energy produced by the collision. She ran forward at full speed, her free hand having already unsheathed and gripped the dagger tightly. Closing the distance, she would effectively follow the path of the ingots, blocking the skeletons field of vision and effectively hiding her from his projectile. This would begin the next phase of her attack. As Saori started to grab for the ingots the Baykok hesitated firing the attack making sure to get an accurate shot. As it is thrown at the Baykok the Baykok seems to hover a little and easily moves to the side avoiding the attack and releasing the attack for a rather close ranged attack. While it's hand is still glowing it appears not to have fired anything however there is a wooshing sound. The Baykok then redraws the bow string. Saori would have ultimately been hit by the arrow should the large bag of iron ingots had not been in front of her. However, Saori came to the quick realization that there were actually no arrows at all. Ones that she could see, at least. They were invisible. She wasn't sure if it was the bow doing it, or a special passive capability that this skeletal creature possessed, but either way, she needed to both dodge this and initiate a counterattack. Quick. 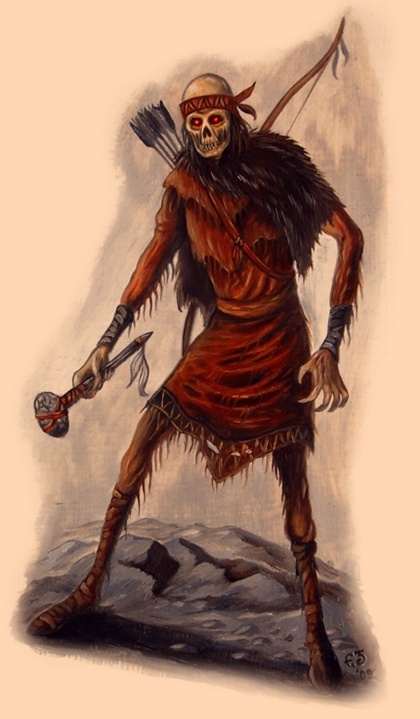 Leaping to the left of the bag, pulling it to the right, allowing for the arrow to hit the ingots instead of her, she would have effectively deflected the arrow, and she sent a hasteful roundhouse kick to the forearm of the Baykok, allowing for the creature to release its grip from the bow if the attack had went as planned. Regardless of it or not, she would have spun in a clockwise manner, allowing her body to face the creature once more. Thrice she would swing at the creature, left hand aimed for the jaw, right hand aimed for the neck, and an upward slash aimed at the pinnacle of its once-positioned adams apple heading straight upward, hopefully cutting the skull in half. The arrow fired at saori at such a close range would have been aimed at her shoulder, due to the creature floating to the side to avoid the bag of ingots it had a clear shot. The creature when drawing its bow another time would be disrupted and the creature would reach for its club and swing at saori, She was in close enough range due to her knife attacks. The swing from the clubs would hit with much force like most mace weapons did on saori’s arms. The creatures skin would flap from being struck by the knifes most of his skin is almost like leather. “LEAVE NOW!” the creature would yell in a tone only undead would be known for doing. The creature seemed to be giving her a warning. The arrow from last post dos 8 damage(16 rating). The club strike dos 18 damage (36 rating). Damage dealt to the creature’s skin is 90 -36 = 54 skin armor remaining. Still full health. (( Since when do I need skills to perform basic hand-to-hand combat? You guys are making it out to seem like someone with Tactician, a higher intellectuality and combat prowess in melee fighting, is nothing more than an imbecile. How can I fight effectively if I can't do anything? Hand to Hand with Swords and heavy weapons like maces shouldn't, true, though daggers is a different story. And exactly how is this creature capable of shooting an arrow and swinging twice in the same post? By your logic the only thing it could have done is fire the arrow, and period, as he also dodged my previous attack. If you're going to impose restrictions, do it correctly. There are many factors which impose against what you say. I have high agility, though it grants me no quicker movement than a snail with your logic, I have high hand-to-hand, which allows quicker strikes with my fists, but not with a dagger that even a child can wield and swing quickly? Realism or not, you're making fights seem more one-sided than normal, especially when its one-on-one. You and Von apparently don't see this because you have complete control over every action imposed by a creature, and both of you possess a weapon that can either completely obliterate enemies (by a high ratio, mind you), or paralyze them inevitably with a simple one-hit contact. Saori would quickly realize the importance of an escape. The way it sat, this battle was not going to end up in her favor. It screamed for her to run after bashing her arms with two (I thought it only had one, as you stated it only having one, lol?) of its heavy handed mace weapons. She would roll, effectively pulling the arrow from her shoulder, taking the bag of ingots and dashing from the scene in an attempt to escape. In the darkness of the night, she utilized her Hiding in Darkness spell to effectively engulf the entirety of her body in complete shadows. Being as though she believed the creature could only light up shadows created by naturalistic properties, she though this may cover her tracks as she continued running. Hopefully escaping the battle, she continuously checked behind her to make sure her quickened agility could outrun such a decrepit being. The undead being would fly back to above the cave. Its body almost blending in with the rocks as it snuck back in between two boulders. It was as if it was guarding something in the cave. Making it attack her when she entered. This creature did not follow her why would it when it had the area to protect from others. Saori would be safe for now. but now this creature would be there for a while.